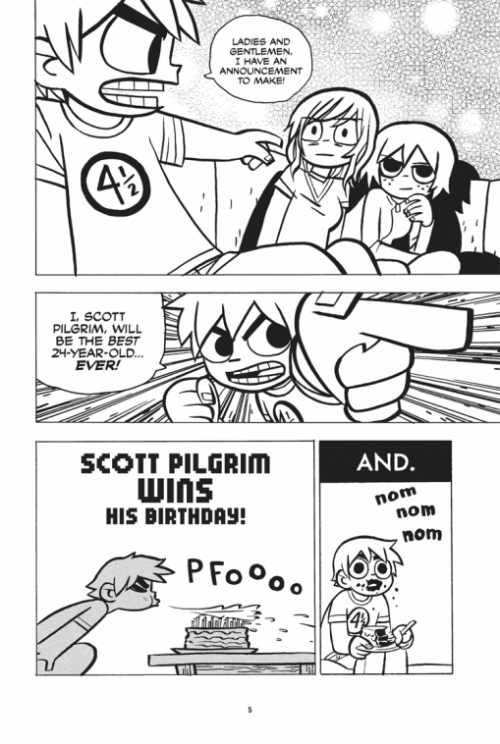 Scott Pilgrim is awesome. That statement is made clear throughout the story. Scott Pilgrim, created by Bryan Lee O’Malley, follows the life of a 23 year old Canadian loafer named Scott, who is dating a 17 year old Chinese girl, shares an apartment with his “cool-gay roommate” Wallace Wells and is in a band. Life is good. Until one day Scott starts to have dreams about a mysterious girl and wouldn’t you know it, soon enough he meets her at a party and is instantly enthralled by her. He soon learns that the girl is named Ramona Victoria Flowers, the Amazon.ca ninja delivery girl, whose moved from New York to Toronto. In order for Scott to be able to go out with her he needs to defeat Ramona’s seven evil exes which by the looks of things shouldn’t be too hard as Scott is the best fighter in the ‘Region’. There have been five digest-sized volumes released so far out of a supposed six, containing various pop culture/video-game references, crazy romantic plot elements as well as wonderful character development and of course tons of comedic moments. The artwork has received some criticism for being too rough and simplistic but I think it works well for this type of story. Overall, a highly enjoyable graphic novel experience which I only found out about after seeing it advertised in a comic at Free Comic Book Day. On another note, a live action film has been confirmed for 2010, *sighs* I won’t be holding my breath given Hollywood’s track record with adaptations of books/comics. This entry was posted in Comics and tagged awesome, bryan lee o'malley, comic-books, oni press, scott pilgrim. Bookmark the permalink.